UniCarriers has added a new feature to the reach trucks in its ergonomic U-TERGO® series with Mast Tilt Control (MTC). This control system for stabilising the mast now forms part of the standard equipment for all high lifting models featuring mast tilt. 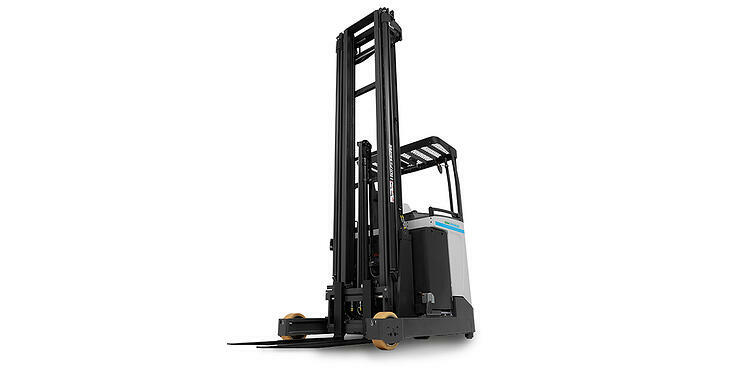 The function is optionally available for reach trucks with lower lift heights and can also be retrofitted in existing vehicles. With MTC, the mast stabilises 80 percent faster, thus allowing stocking and retrieving at higher speeds when reach trucks work at great heights. Users achieve shorter cycle times and greater convenience for goods handling. A reach truck mast is exposed for significant forces while stacking and retrieving pallets. Even if the mast design is strong and robust, extended greatly, it will inevitably sway. This means drivers need to wait when stocking or retrieving pallets since the mast needs to stabilise first. UniCarriers now minimises waiting times with its new Mast Tilt Control (MTC) system, ensuring faster pallet handling. The automatic damping function absorbs unwanted mast movements and ensures 80 percent faster mast stabilisation. "The market is always on the lookout for material handling solutions which provide the swiftest possible movement of goods. Our reach trucks help users to achieve maximum throughput and low total operating costs. Mast Tilt Control is a key element in accomplishing this," explains Jan Callderyd, Group Product Planning Manager at UniCarriers Europe. The completely maintenance-free MTC system is not only efficient, but also highly ergonomic. Thanks to reduced vibrations, the driver has more control and greater safety when operating stocking and retrieval processes at great lift heights. The MTC brings maximum benefit when combined with the S3 – Soft Motion System, which is featured as standard in all models in the UniCarriers TERGO® line since 2017. S3 automatically optimises speed of the hydraulic functions such as mast reach and mast tilt as well as side shift function in relation to the actual lift height and mast configuration. The system also contains an optimised reach damping function and precise speed control for very low speeds, ensuring it is very pleasant and easy to control. As a result, the combined use of MTC and S3 reduces pallet placement in storage and retrieval time by twelve percent. Image: Stabilising the mast: Mast Tilt Control is now standard equipment to the reach trucks in UniCarriers’ U-TERGO® series especially to all high lifting models featuring mast tilt. UniCarriers is a globally active developer and manufacturer of industrial trucks. Its versatile, customisable transport solutions for logistics and warehouses are produced at its production facilities in Sweden, Spain, Japan, China and the US. Its products are sold at specialist retailers or directly to end customers by an experienced team of sales experts. Its main customers are in the automotive, construction, food, logistics and pharmaceuticals sectors, heavy industry and the processing industry. UniCarriers was formed in 2011 following the merger of Nissan Forklift, TCM and Atlet. Since 2017 the brand has belonged to Mitsubishi Logisnext Co., Ltd. based in Kyoto, Japan. UniCarriers Europe AB, based in Mölnlycke, near Gothenburg, Sweden, is a one-hundred-percent subsidiary of the Japanese corporation. With a portfolio comprising six brands, 11,000 employees and total sales of around 3.3 billion euros in the financial year 2017, Mitsubishi Logisnext is the world’s third-largest forklift manufacturer.